Download "Emotional intelligence: an integral part of positive psychology"
1 Psychological Society of South Africa. All rights reserved. 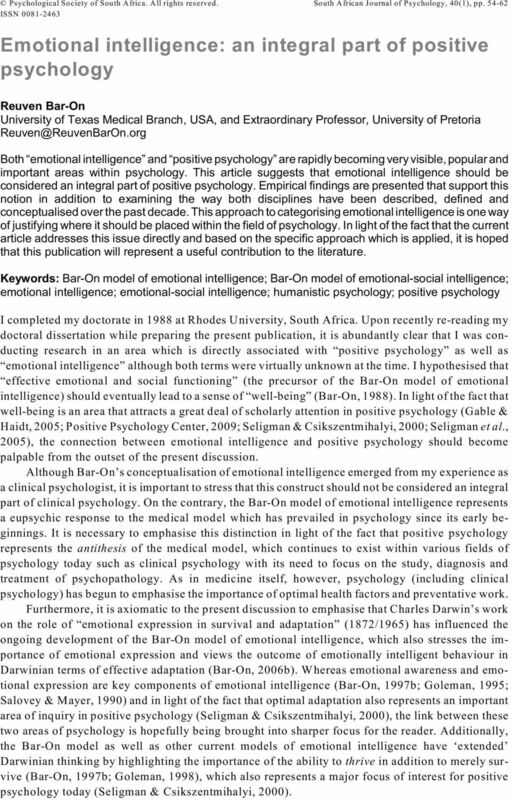 South African Journal of Psychology, 40(1), pp ISSN Emotional intelligence: an integral part of positive psychology Reuven Bar-On University of Texas Medical Branch, USA, and Extraordinary Professor, University of Pretoria Both emotional intelligence and positive psychology are rapidly becoming very visible, popular and important areas within psychology. 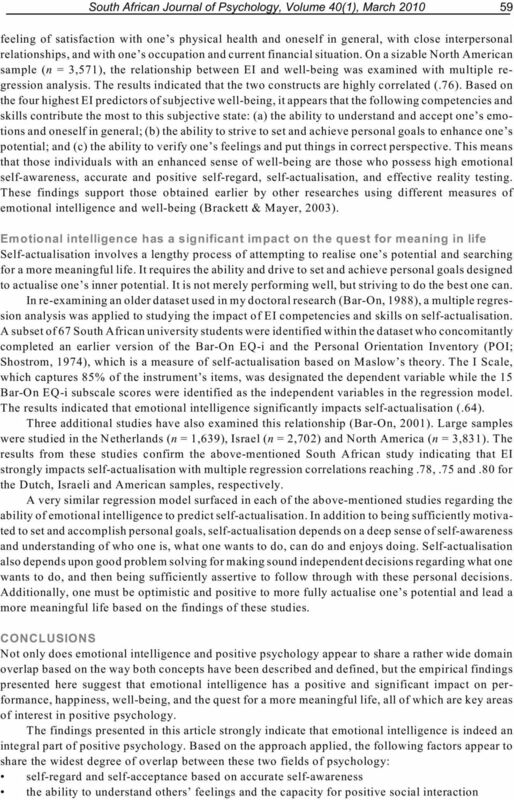 This article suggests that emotional intelligence should be considered an integral part of positive psychology. Empirical findings are presented that support this notion in addition to examining the way both disciplines have been described, defined and conceptualised over the past decade. This approach to categorising emotional intelligence is one way of justifying where it should be placed within the field of psychology. In light of the fact that the current article addresses this issue directly and based on the specific approach which is applied, it is hoped that this publication will represent a useful contribution to the literature. Keywords: Bar-On model of emotional intelligence; Bar-On model of emotional-social intelligence; emotional intelligence; emotional-social intelligence; humanistic psychology; positive psychology I completed my doctorate in 1988 at Rhodes University, South Africa. 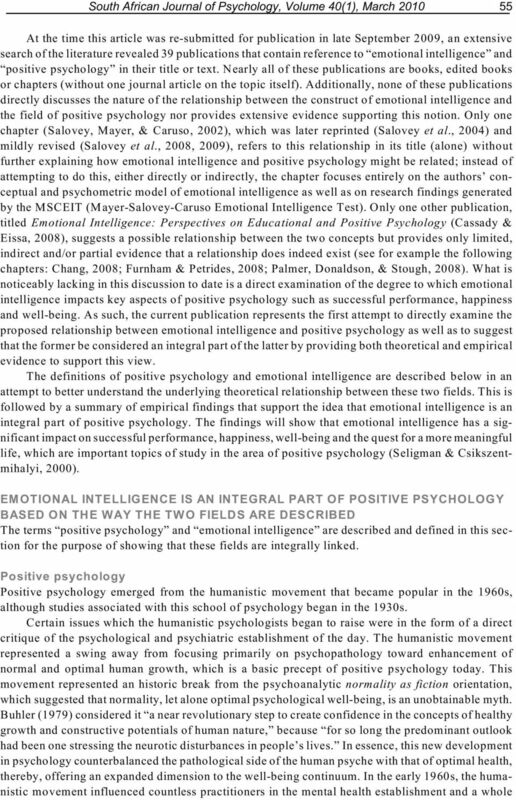 Upon recently re-reading my doctoral dissertation while preparing the present publication, it is abundantly clear that I was conducting research in an area which is directly associated with positive psychology as well as emotional intelligence although both terms were virtually unknown at the time. I hypothesised that effective emotional and social functioning (the precursor of the Bar-On model of emotional intelligence) should eventually lead to a sense of well-being (Bar-On, 1988). In light of the fact that well-being is an area that attracts a great deal of scholarly attention in positive psychology (Gable & Haidt, 2005; Positive Psychology Center, 2009; Seligman & Csikszentmihalyi, 2000; Seligman et al., 2005), the connection between emotional intelligence and positive psychology should become palpable from the outset of the present discussion. 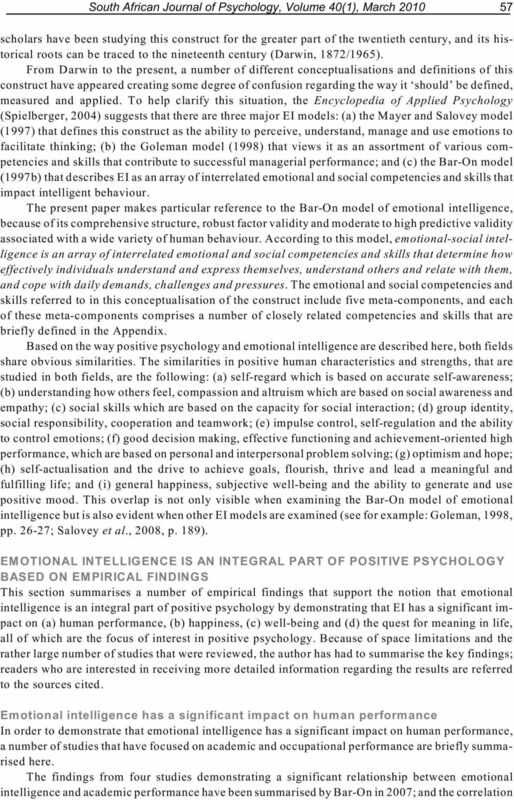 Although Bar-On s conceptualisation of emotional intelligence emerged from my experience as a clinical psychologist, it is important to stress that this construct should not be considered an integral part of clinical psychology. 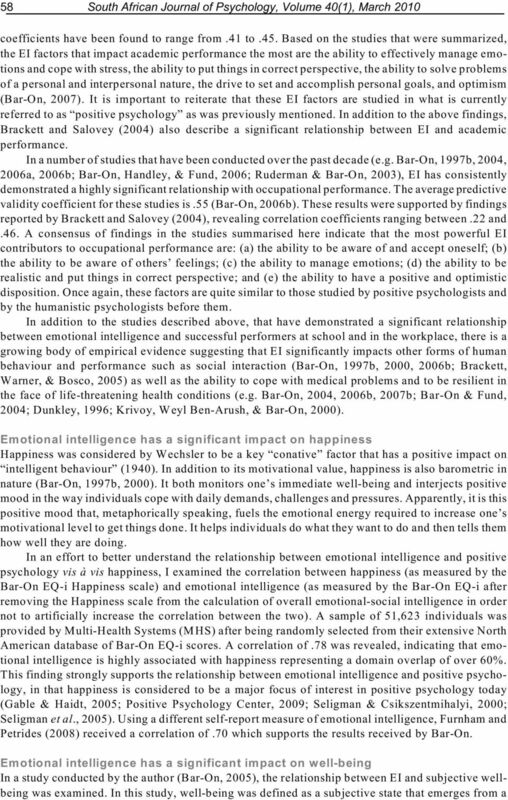 On the contrary, the Bar-On model of emotional intelligence represents a eupsychic response to the medical model which has prevailed in psychology since its early beginnings. It is necessary to emphasise this distinction in light of the fact that positive psychology represents the antithesis of the medical model, which continues to exist within various fields of psychology today such as clinical psychology with its need to focus on the study, diagnosis and treatment of psychopathology. As in medicine itself, however, psychology (including clinical psychology) has begun to emphasise the importance of optimal health factors and preventative work. Furthermore, it is axiomatic to the present discussion to emphasise that Charles Darwin s work on the role of emotional expression in survival and adaptation (1872/1965) has influenced the ongoing development of the Bar-On model of emotional intelligence, which also stresses the importance of emotional expression and views the outcome of emotionally intelligent behaviour in Darwinian terms of effective adaptation (Bar-On, 2006b). Whereas emotional awareness and emotional expression are key components of emotional intelligence (Bar-On, 1997b; Goleman, 1995; Salovey & Mayer, 1990) and in light of the fact that optimal adaptation also represents an important area of inquiry in positive psychology (Seligman & Csikszentmihalyi, 2000), the link between these two areas of psychology is hopefully being brought into sharper focus for the reader. Additionally, the Bar-On model as well as other current models of emotional intelligence have extended Darwinian thinking by highlighting the importance of the ability to thrive in addition to merely survive (Bar-On, 1997b; Goleman, 1998), which also represents a major focus of interest for positive psychology today (Seligman & Csikszentmihalyi, 2000). 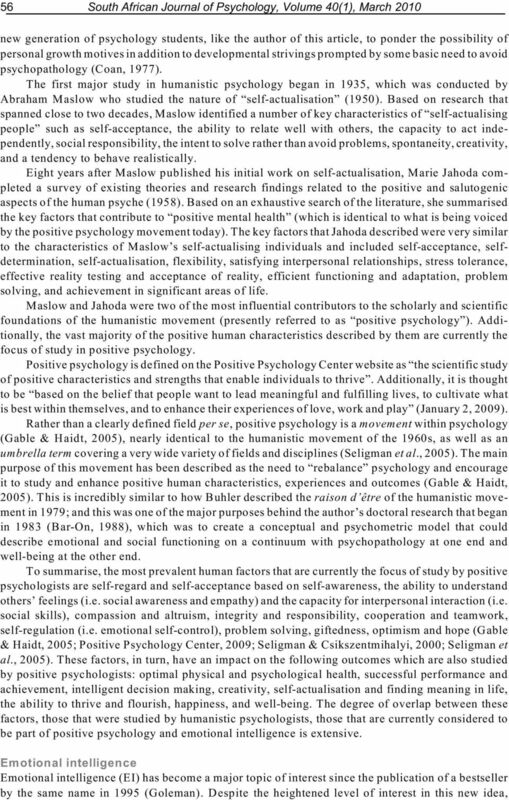 9 62 South African Journal of Psychology, Volume 40(1), March 2010 Positive Psychology Center Website (January 2, 2009). Positive psychology. Ruderman, M., & Bar-On, R. (2003). The impact of emotional intelligence on leadership. Unpublished manuscript. Salovey, P., & Mayer, J. D. (1990). Emotional intelligence. Imagination, Cognition and Personality, 9, Salovey, P., Mayer, J. D., & Caruso, D. (2002). The positive psychology of emotional intelligence. In C. R. Synder, & S. J. Lopez (Eds), Handbook of positive psychology. New York: Oxford University Press, pp Salovey, P., Mayer, J. D., & Caruso, D. (2004). The positive psychology of emotional intelligence. 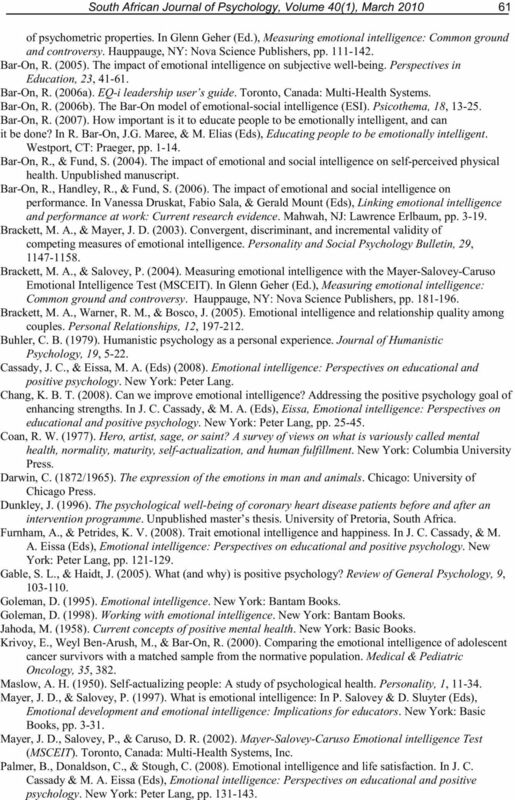 In P. Salovey, M. A. Brackett, & J. D. Mayer, J. D., Emotional intelligence : Key readings on the Mayer and Salovey model. Port Chester, N.Y.: Dude Pub. Salovey, P., Mayer, J. D., Caruso, D., & Yoo, S. H. (2008). The positive psychology of emotional intelligence. 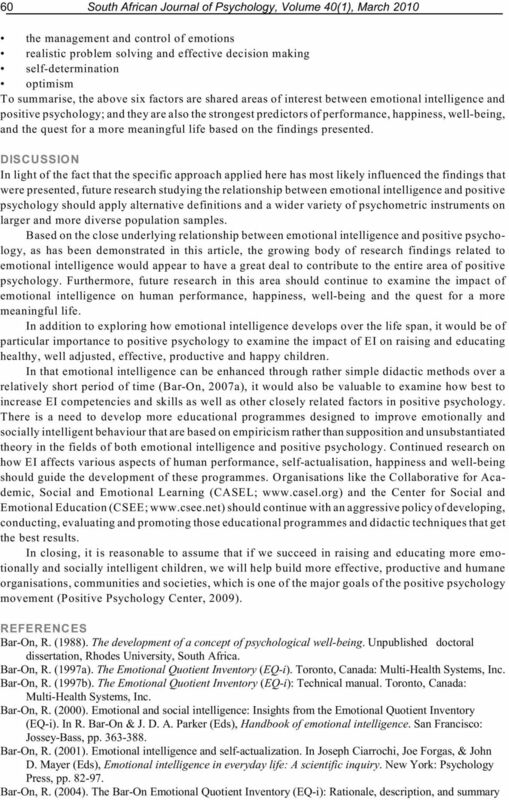 In J. C. Cassady, & M. A. Eissa (Eds), Emotional intelligence perspectives on educational and positive psychology. New York: Peter Lang, pp Salovey, P., Mayer, J. D., Caruso, D., & Yoo, S. H. (2009). The positive psychology of emotional intelligence. In C. R. Synder, & S. J. Lopez (Eds), Oxford handbook of positive psychology. New York: Oxford University Press. Seligman, M. E. P., & Csikszentmihalyi, M. (2000). Positive psychology. American Psychologist, 55, Seligman, M. E. P., Steen, T. A., Park, N., & Peterson, C. (2005). Positive psychology progress: Empirical validation of interventions. American Psychologist, 60, Shostrom, E. L. (1974). Personal Orientation Inventory: An inventory for the measurement of self-actualization. San Diego, CA: Educational Industrial Testing Service. Spielberger, C. (Ed.) (2004). Encyclopedia of Applied Psychology. Academic Press. Wechsler, D. (1940). Nonintellective factors in general intelligence. Psychological Bulletin, 37, APPENDIX The Bar-On EQ-i subscales and what they assess EQ-I subscales Intrapersonal: Self-Regard Emotional Self-Awareness Assertiveness Independence Self-Actualization Interpersonal: Empathy Social Responsibility Interpersonal Relationship Stress Management: Stress Tolerance Impulse Control Adaptability: Reality-Testing Flexibility Problem Solving General Mood: Optimism Happiness The EI competencies and skills assessed by each subscale To accurately perceive, understand and accept oneself. To be aware of and understand one s emotions. To effectively and constructively express one s feelings and oneself. To be self-reliant and free of emotional dependency on others. To strive to achieve personal goals and actualize one s potential. To be aware of and understand how others feel. To identify with one s social group and cooperate with others. To establish mutually satisfying relationships and relate well with others. To effectively and constructively manage emotions. To effectively and constructively control emotions. To objectively validate one s feelings and thinking with external reality. To adapt and adjust one s feelings and thinking to new situations. To effectively solve problems of a personal and interpersonal nature. To be positive and look at the brighter side of life. To feel content with oneself, others and life in general. 1 The Bar-On Model of Emotional-Social Intelligence (ESI) 1 Reuven Bar-On University of Texas Medical Branch Original Reference Bar-On, R. (2006). 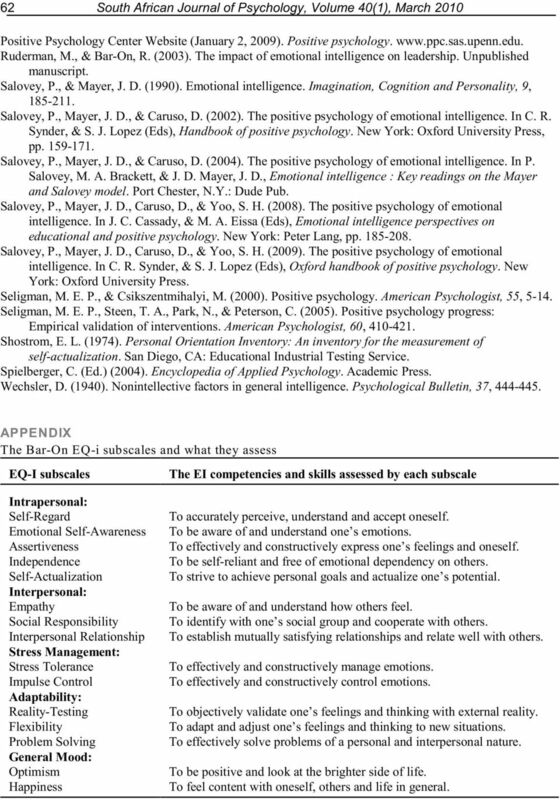 The Bar-On model of emotional-social intelligence (ESI). Evaluating a fatigue management training program for coach drivers. POSITIVE EDUCATION: NURTURING THRIVING TEACHERS & FLOURISHING STUDENTS Positive psychology is an emerging applied science that is beginning to have a significant impact on schools and classroom interventions. Emotional Intelligence: Does it Make Sense in Clinical Psychology? Applied Psychology s AP 6001 PRACTICUM SEMINAR I 1 CREDIT AP 6002 PRACTICUM SEMINAR II 3 CREDITS Prerequisites: AP 6001: Successful completion of core courses. Approval of practicum site by program coordinator. Emotional Intelligence for Lawyer By Ronda Muir, ESQ. Trait Emotional Intelligence and Psychological Wellbeing in Drug Addicts: A Correlational Study.